I've been craving for some cold yogurt barks. 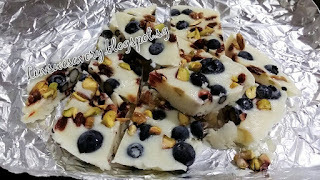 With some yogurt and blueberries in the fridge, it is not difficult to mix everything on a plate/tray and off it goes into the freezer ... Yogurt Bark again ! Goji berries are known as antioxidants, offer benefits for the skin, immune system, and more. Source sharing :here That's why I often add some into my tea, soups or desserts. Or simply just sprinkle some on frozen yogurt bark. My previous "brain freeze" yogurt bark here This time I've added blueberries and replaced almond with pistachio. 30g pistachios kernels coarsely chopped into pieces. I used a round medium size Pyrex dish and line with aluminium foil leave with enough to grasp. Set aside. You could use small baking sheet or pan. Scatter some goji berries. In a small bowl, gently mix the chopped pistachios, blueberries and the remaining goji berries with 1 tablespoon of honey. Set aside. Scatter the blueberries mixture evenly over the yogurt. 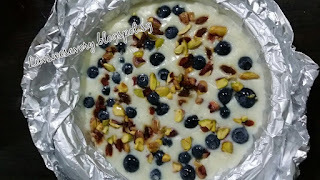 Lightly press the blueberries and pistachios onto the yogurt. Do not cover and freeze about 4 hours or overnight until hardened/solid. When completely solid, remove from freezer and lift the aluminium foil out of the dish/pan and set on a hard surface. Cut into serving pieces and serve immediately, or keep frozen in an re-sealable plastic bag/container. Yum! and my mouth is 'freezing cold' ... perfect to have some in hot weather here. Enjoy ! Karen, that makes a great snack on a hot day! 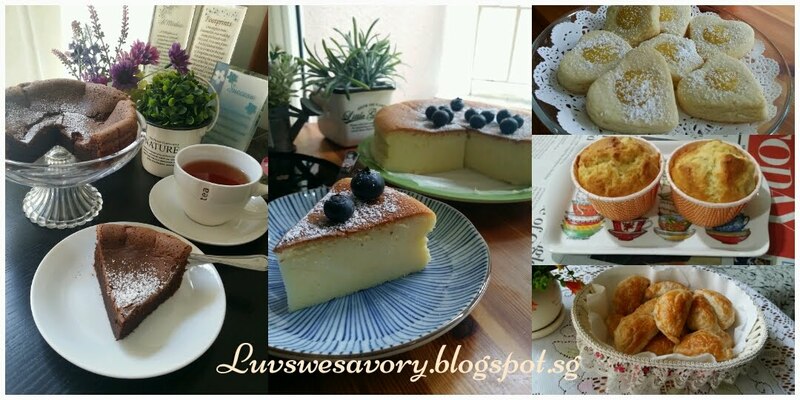 Can't agree more ... these cold desserts definitely tasted "shiok"on hot day! 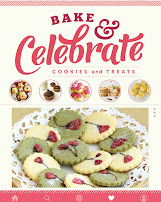 Great yummy snacks when reading a book or watching TV!